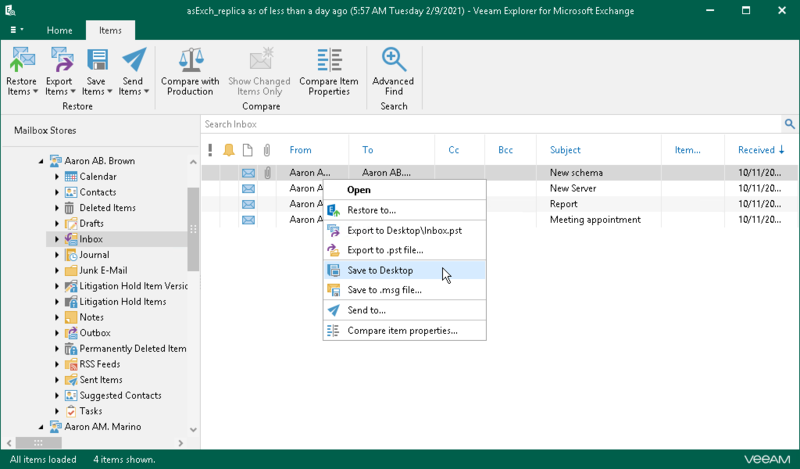 Veeam Explorer for Microsoft Exchange allows you to save any item as Microsoft Exchange Mail Document (.msg) files. In the navigation pane, select an item. On the Items tab, select Save Items > Save to .msg file or right-click a folder/item and select Save to .msg file. In the preview pane, select items. Use the Search field to find particular items. On the Items tab, select Save Items > Save to <folder_name> or right-click a folder/item and select Save to <folder_name>. A <folder_name> name depends on the latest location that was used when saving items.